This my friends, is how to play our server. some people are confused. ok.
1. Download BOTH the v62 set-up AND the BeastMS client in the Download page on website. 2. After done download locate the files. /set up, if you have Firefox, ur downloads should be in your "downloads folder." under <your comp name> > documents > downloads. For example, David > Documents > Downloads. 3. Now, run the v62 Set-Up and install the v62 FILES. In the proccess, you should be able to choose the folder you want it to be saved in. 4. After you got the WZ files, open up the folder that contains the BeastMS client and right click and press COPY. 5. Go to your v62 FILES and PASTE your BeastMS client into the v62 WZ files. 6. Click on the BeastMS client. Warning. 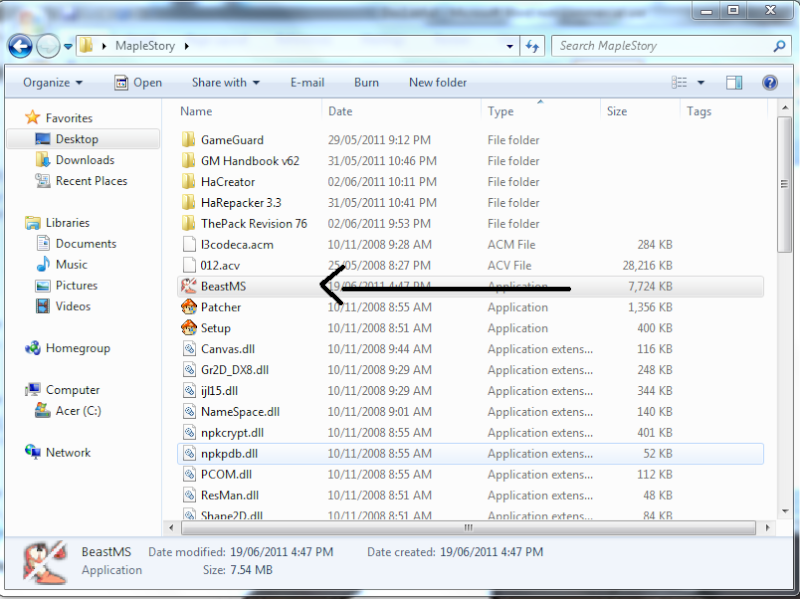 When you get the v62 files, u will also get a mushroom looking icon. IGNORE IT.